The sweet smell of honeysuckle has been in the air and do you know what that means? Yep, that’s right, summer is here! It’s the time to gather your family and friends and head out to the fields to pick juicy, sweet strawberries. What could be better than spending a summer afternoon outdoors, picking your own perfectly ripe strawberries? 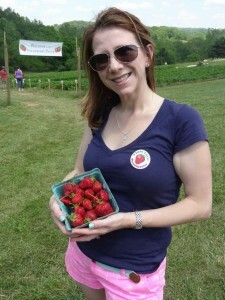 Jason and I have talked about going strawberry picking since we got married, which was over 6 years ago, but strawberry season is such a busy time for us. Last Saturday, we woke up and decided on a whim to head out to the fields. We decided to try Wegmeyer Farms in Hamilton, Va. The scenic ride to the farm was breathtaking and well worth and trip. We brought home several pounds of strawberries and have been busy in the kitchen coming up with tons of recipes, which we’ll be sharing with you shortly. Stay tune to this post to check out how we enjoyed the sweet favors of the season. Are you ready to head to the berry fields? We have just a couple of tips to share.